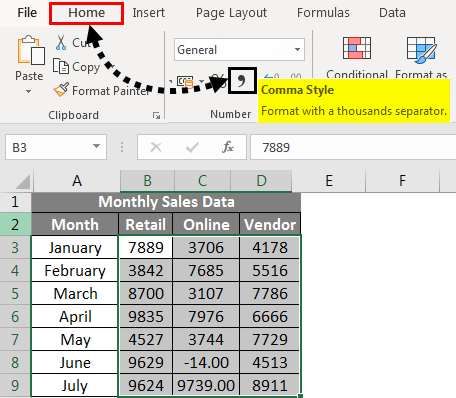 Comma Style in Excel | How to Apply Comma Style in Excel? 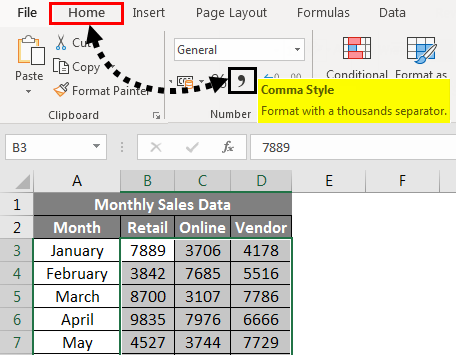 How to Apply Comma Style in Excel? The appearance of a numeric value or numbers that are entered in an Excel cell can be changed in many different ways. 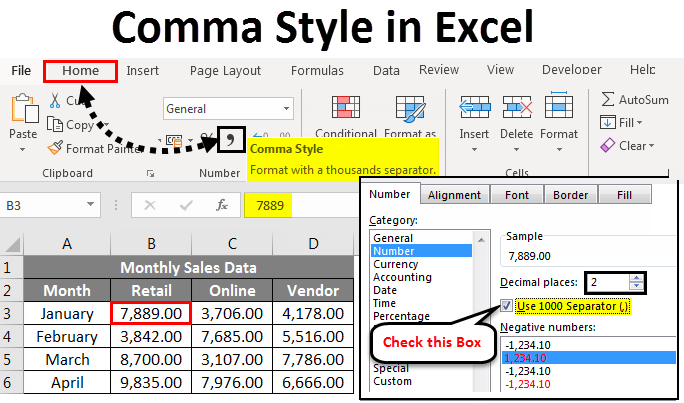 By default, in your sale data numbers or any numeric values in excel do not show commas or first two decimals for your entries at the end, so that it becomes very difficult to read & analyze the numbers or numeric values. Excel has various in-built number formats for percentage, numbers or numeric values, currency, date, time data values. Comma style format is categorized under Number format section in the Home tab. Comma style format is also referred to as thousands separator. This format will be very helpful when you are working on a large table of financial sales data (Quarterly or half or Annual sales data), Comma style format is applied here, and numbers appear better. It is used to define the behavior of digits in relation to the thousands or lacks or millions or billions of digits. Comma Style format offers a good alternative to the Currency format. Comma style format inserts commas in larger numbers to separate thousands, hundred thousand, millions, billions and so on. Comma style is a type of number format where it adds commas to large numbers, adds two decimal places (i.e. 1000 becomes 1,000.00), displays negative values in closed parentheses & represents zeros with a dash (–). Prior to working on comma style number format, we need to check whether decimal & thousand separators are enabled or not in excel. If it is not enabled, we need to enable it & update by below-mentioned steps. To check decimal and thousands separators in Excel, click the File tab. Click Options in the list of items on the left-hand side, Excel Options dialog box appears. 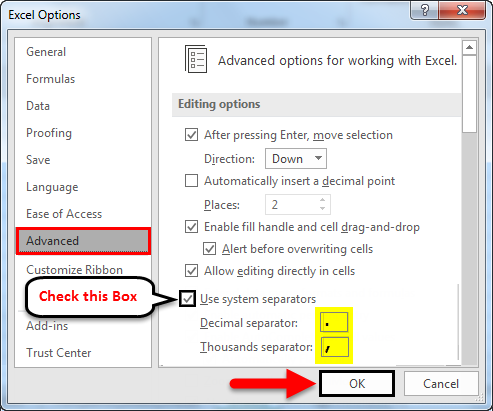 In the Excel Options dialog box. Click Advanced in the list of items on the left-hand side. Under the editing options, Click or Tick on the Use system separators checkbox if there is no check mark in the box. 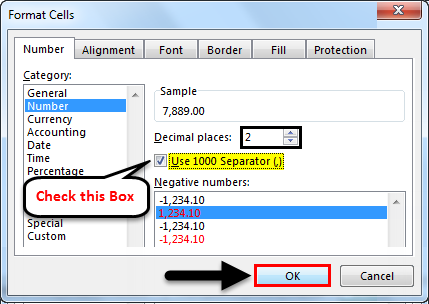 The Decimal separator and Thousands separator edit boxes displayed once you click on “Use system separators” checkbox. Here I selected a comma as the Thousands separator and a full point as the Decimal separator. After that click on OK. These separators are automatically inserted into all the numbers in your workbook when you use comma style number format. Different types of Numeric value or Number types which you come across in sales data are as follows. 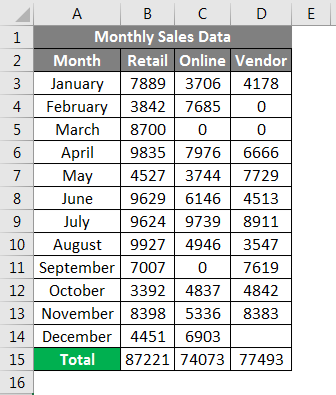 In the below mentioned example, I have a monthly sales data of a company, which contains retail, online & vendor sales numbers on a monthly basis, in this raw sales data, the appearance of the data is without any number format applied to it. So, I need to apply comma style number format for these positive sales value. 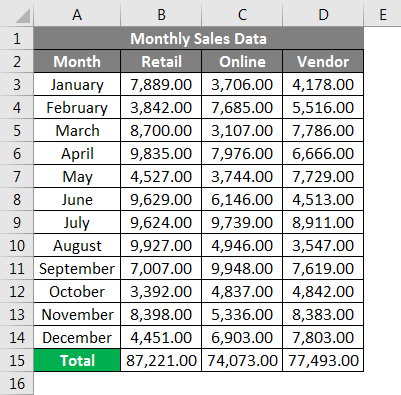 Select the cells containing numeric sales values for which I want to display numbers with comma style number format. On the Home tab, in the Number group you can select Comma symbol & click on the Comma Style .command. Or it can be done another way i.e. 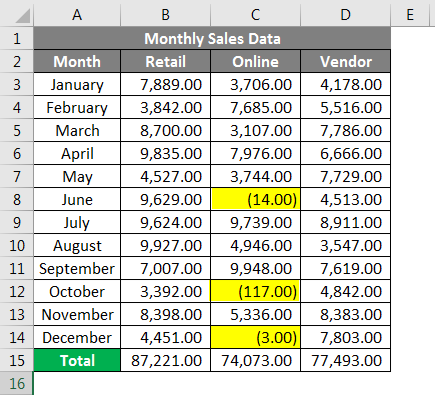 once you select numeric sales values, then right click, select Format Cells, After that window appears, in that under number section, you need to select Number under Category and check the box of Use 1000 Separator and in the Decimal places enter the value 2 & Click OK.
Once you have clicked on Comma Style button, you can see the changes in the sales value, where excel separates the thousands with comma and adds two decimal places at the end. In the first cell you can observe where 7889 becomes 7,889.00. Result is shown below. 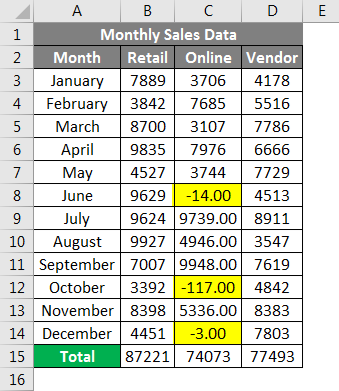 In the below mentioned example, I have monthly sales data of a company, which contains retail, online & vendor sales numbers on a monthly basis, in this raw sales data, it contains both positive & negative values. Currently, the appearance of the sales data is without any number format applied to it. So, I need to apply comma style number format for these positive & negative values. 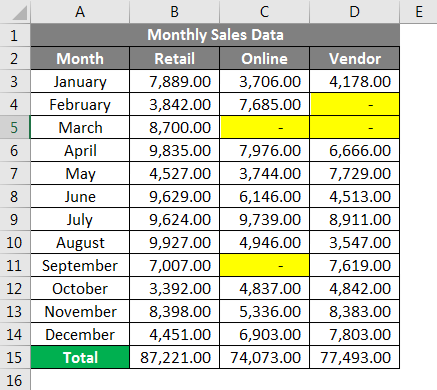 Select the cells containing numeric sales values for which I want to display numbers with comma style number format. On the Home tab, in the Number group, you can select comma symbol & click on the Comma Style command. Once you have clicked on Comma Style button, you can see the changes in the sales value. 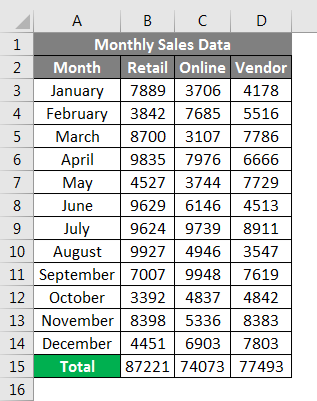 In the below-mentioned example, I have a monthly sales data of a company, which contains retail, online & vendor sales numbers on a monthly basis, in this raw sales data, it contains both positive & Zero values. Currently, the appearance of the sales data is without any number format applied to it. So, I need to apply a comma style number format for these positive & Zero values. Where excel separates the thousands with comma and adds two decimal places at end and Zero values are represented by a dash symbol. Comma style number Format option in excel makes your data easier to access & readable, it also helps you to setup your sales data at an industry standard. Apart from various number format option in excel, you can create your own custom number format in Excel based on your choice. How to Merge Cells in Excel?